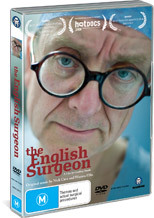 The English Surgeon is one of the most endearing documentaries of late that follows British brain surgeon Henry Marsh on his journey to improve the medical conditions of Eastern Europe. Appalled by the conditions in a KGB hospital in Kiev, he vowed to give the people of this country a chance to survive from their tumors and through hard work, Marsh managed to collect a variety of discarded and second-hand medical equipment. Director Geoffrey Smith takes the viewer on a rollercoaster ride as Marsh once again visits the Ukraine as he attempts to help the grief stricken and to compound the situation, he is still haunted by an operation he performed that went wrong for a young girl. Marsh also assists the local surgeons with his "Western" techniques as Igor Kurilets become his student as he attempts to transfer his knowledge which is quite a powerful moment in the documentary. The documentary is quite dramatic at times, however it also gives a human face to these brave men and women and how one man fights almost unbeatable odds to give others a second chance of life. Match that with the amazing musical score by Nick Cave and Warren Ellis and it's very difficult not to become emotional from this extraordinary man and the unfortunately predicament of others. Presented in high definition, director Geoffrey Smith really uses the colours of Kiev to assist in the story telling which gives an almost ethereal feel to the documentary. At the end of the day, this is one documentary that everyone should watch as it will definitely inspire. Highly Recommended!